Yippee ki-yay! Bring out the bubbly and help me celebrate this 200th blog you are reading right now. Who would have guessed – especially with my tumultuous relationship with technology. Second, this same friend then sent me a blog about writing blogs: https://www.enchantingmarketing.com/category/blog/. They have changed the format somewhat over the past few years, however, when he first sent it to me, I became intrigued. I immediately googled the word blog to figure out what he was talking about. And there it was, my rule of three! Now I HAD to look into writing a blog. As it turned out, I was leaving on trip to England so I took that book with me. 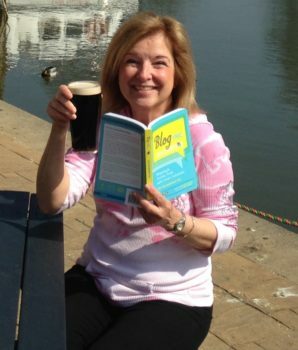 There, sitting on the Thames River, sipping a Guinness, my first blog was born. When I returned home, I hired someone to set up everything I needed to begin posting my blogs. Since then, I have never missed a week. This is the picture I posted along with my first blog on May 4, 2015. I truly hope you have found some joy or inspiration or peace in reading my blogs all these years. Each and every one has been written with you in mind.